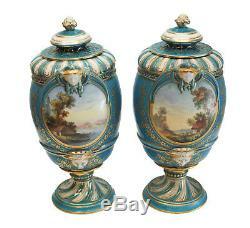 Description: Pair Sevres France porcelain hand painted urns, 19th Century. The central image shows period era mothers doing chores with their children and seascapes to the verso. Figural female heads to the edges of the paintings. 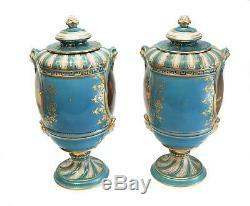 Teal blue ground with etched gilt accents throughout. Sevres mark to the underside. 5.25" diameter x 10.5" tall Condition: Great condition. Please view our selection of quality items. For sale at Gallery XV! (This item is located in Gardena, CA). Domestic & International Customers - WELCOME! We guarantee the authenticity of all items to be as represented. We make a best effort to provide a fair and descriptive condition report. Gallery XV specializes in a variety of art, antiques, jewelry and collectibles. It's just the tip of the ice berg. We are prompt and professional with our correspondence and appreciate you taking the time to shop with us. "You are only as good as your last feedback". 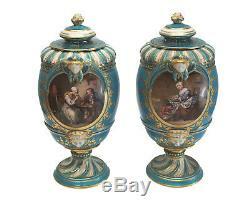 The item "Pair Sevres France Porcelain Hand Painted Urns, 19th Century. Mothers & Children" is in sale since Wednesday, December 19, 2018. This item is in the category "Antiques\Decorative Arts\Ceramics & Porcelain\Urns". The seller is "gallery_xv" and is located in Gardena, California. This item can be shipped worldwide.